George H. W. Bush and Mikhail Gorbachev could not have come from more different backgrounds. Yet, the leaders of the world’s two undisputed superpowers became inextricably linked as central architects of the dramatic end to the Cold War between the United States and Soviet Union. Now the authors of two new biographies about these singular men examine the historical milestone through the lens of their subjects in Dueling Views of the Cold War’s End—part of the World Affairs Council’s Look Back on the Soviet Era series. In Gorbachev: His Life and Times, William Taubman—Pulitzer-prize winning author and professor emeritus at Amherst College—reveals how a peasant’s son became the leader who would fundamentally change Russia despite the wrath of his people, a failed coup and an attempt on his life. Jeffrey Engel, a noted historian, director of the Center for Presidential History at SMU and author of When the World Seemed New: George H.W. 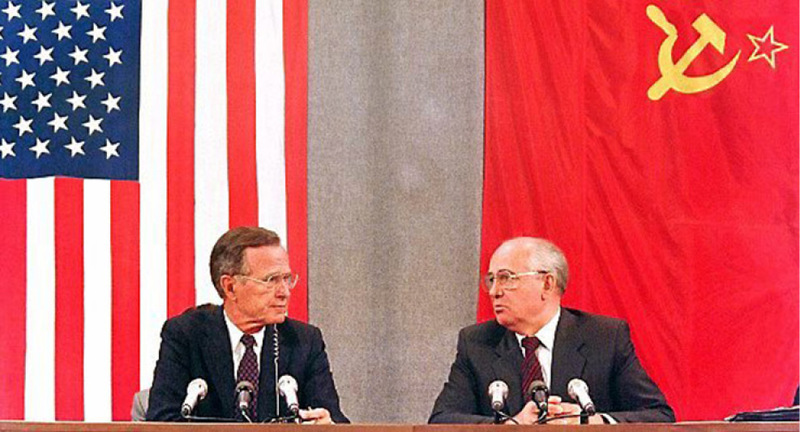 Bush and the End of the Cold War chronicles Bush’s mistrust of the Soviet leader and his decision to support Gorbachev’s arch-rival—Boris Yeltsin. The thought-provoking discussion will be moderated by Svetlana Savranskaya and Thomas Blanton, principals with George Washington University’s National Security Archive and co-authors of The Last Superpower Summits: Gorbachev, Reagan and Bush: Conversations that Ended the Cold War. Contact: This event is sold out. To be added to our waitlist, please call (214) 965-8407.